Oops - we don't appear to have a video for the CR-120 Cheque. 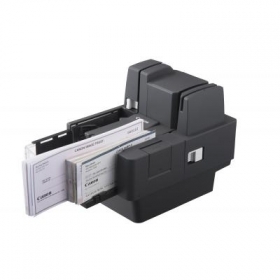 Quickly scan up to 120 or 150 cheques per minute with these highly compact devices – ideal for customer service desks – using accurate magnetic and optical reading, and include endorsement imprinters. The CR-120 UV includes built-in ultraviolet sensors for detecting anti-fraud patterns that prove cheques’ authenticity, or highlighting surface rubbing that might indicate tampering. With UV scanning, both the 200dpi grey scale image and a UV image of the cheque are captured simultaneously, with no loss of speed. Both series of scanner employ precise magnetic ink character recognition (MICR) to read code line data, and also capture grey scale images of both sides of each cheque. Powerful OCR software then reads the characters from the scanned image and cross-check them using a unique algorithm to ensure maximum accuracy. You can easily integrate your CR-120 or CR-150 series cheque scanners with existing systems including virtual device environments, using bundled software: Canon Scanning Utility, Canon ISIS/ TWAIN driver, and a Ranger Transport API driver. Application developers can also take advantage of the Canon CR software development kit (SDK) to create custom capabilities. There is a built-in imprinter that enables quick and easy print endorsement on the back of cheques while they are being scanned. Up to five lines of 60-character text, as well as high quality bitmap images, can be printed in a single motion, ensuring no loss of overall cheque scanning speed.